Put on your party hats, here come the stuffed pink flamingos and plush pink flamingos! These amazing birds are symbolic with good times so each stuffed pink flamingo that we carry is rigorously tested to ensure that it is ready to brighten up your life. 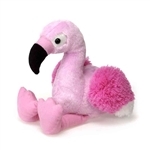 It's really simple to test a plush pink flamingo for funnability. (yeah, that's a word) All we do is look each stuffed pink flamingo in the eye and wait for a smile to start to form. Generally, the smile is instant. It is extremely rare for a plush pink flamingo to fail this test, in fact, not one has failed since the test was developed. 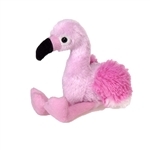 If you're ready for some fun in the sun then sit back, grab a nice cool drink, and enjoy our great selection of stuffed flamingos and plush flamingos.